At a glimpse: Discusses transplanting five tree species grown in Bags. Nature of work: Successful establishment of transplanted trees depends on rapid regeneration of the root system. Minimizing the root-shoot imbalance by harvesting should allow the tree to re-establish its characteristic root-shoot ratio at a more rapid rate, resulting in maximum survival and rapid growth (9). Root regeneration potential varies with species, physiological and development stage of the plant, and the environment (6). Many tree species exhibit seasonal periodicity of root regeneration potential with maximum rooting prior to bud-break and potentials declining after bud-break as carbohydrates are reallocated to elongating shoots. Difficult-to-transplant species are best transplanted in the spring prior to bud-break (3, 4, 5, 7). Researchers have shown a positive correlation between the successful establishment of plants and the density of the harvested root system (l, 8). A nursery tree’s root system is drastically reduced when harvested and consequently the amount of soil exploited to gain water and nutrients is reduced to only a small fraction of what it was when undisturbed in the nursery (2, 10). Restricting the roots with a fabric barrier and trickle irrigating are attempts at increasing the amount of roots, moved with transplanted trees. Claims of up to 80% or more of the root system being retained by fabric field containers (12) and rapid root regeneration following summer transplanting (11) have been made, yet these figures have not been substantiated with replicated experiments including conventional B&B trees for comparative purposes. It is not known whether substantial increases in harvested root weights can be obtained with fabric field containers and trickle irrigation resulting in commensurate increases in new root growth after transplanting. The purpose of this study was to determine the effect of three planting methods and trickle irrigation on potential for root regeneration. The three plantings methods included 18-inch-diameter (46-cm) fabric Field-Grow container (Root Control, Inc., Oklahoma City, OK) trees grown in flat beds and 24-inch-diameter (61-cm) B&B trees grown in flat and raised beds within trickle irrigated and non-irrigated plots. Uniform 1-gal (3.8-l) container grown liners of Acer rubrum (red maple), Betula nigra (river birch), Pinus Elliotti (slash pine), Quercus virginiana (live oak), and Taxodium distichum (bald cypress) were transplanted in April 1985. Trees were spaced 4-ft (1.22-m) within and 6-ft (1.83-m) between rows [1,815-trees/A (4,485 trees/ha)]. The experimental design was a split-plot with 5 replications and two singletree sub samples. Irrigation treatments comprised the main plot, with planting methods as the sub-plot. All trees were harvested in April 1987. One tree sub-sample of each replicate was sacrificed to obtain root dry weights and a root ranting within the harvested root ball. The other tree sub-sample was transported to an outdoor limestone bed area with overhead irrigation and maintained in full sun for 30 to 35 days, after which time it was transplanted into a 30-gal (114-l) container and extracted 60 days later to determine potential for root generation. Fabric field containers were removed prior to transplanting, whereas, burlap and protective wire baskets on B&B trees were left intact. Only those new roots growing into the artificial medium were harvested, washed and dry weights determined. The medium consisted of pine bark (pH = 3.8) amended with 2 lb N/yd3 (3.56 kg/m3) dolomite, and 1.5 lb/yd3 (.89 kg/m3) Micromax. Trees were irrigated every other day with .5-in (1.3-cm) of water through low volume spray emitters. 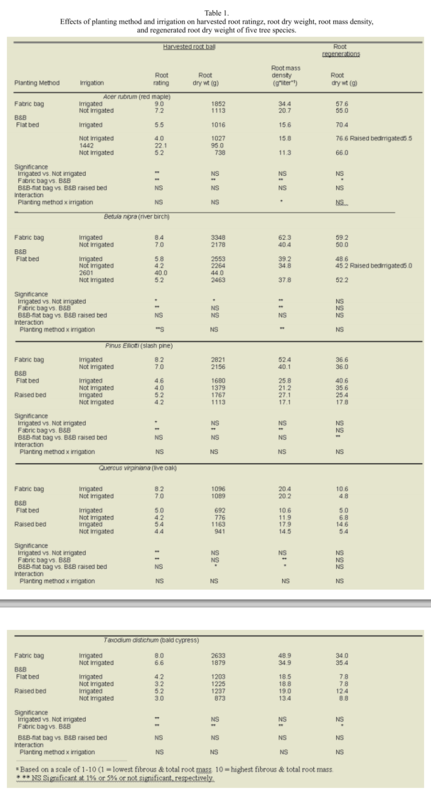 Results and Discussion: Fabric bags and trickle irrigation increased the fibrous root content of harvested root balls for all species as indicated by the higher root ratings (Table 1). Significant increases in harvested root dry weights were obtained with fabric bag treatments for Acer, Pinus and Taxodium. Quercus harvested root dry weights were greater for B&B-raised bed trees compared with B&B-flat bed trees. The harvested root zone of fabric bag trees was 17% smaller than B&B trees and comparisons of root dry weights based on soil volume (root mass density) showed significant increases with fabric bag treatment for all species. Irrigation significantly increased harvested root dry weights and root mass densities for Betula. Greatest harvested root dry weights and root mass densities were obtained with irrigated fabric bag and irrigated B&B-raised bed trees for all species. Fabric bags significantly increased the fibrous root content and root mass density of harvested root balls for all species, yet a corresponding increase in regenerated roots after transplanting was only observed with Taxodium. Acer root regeneration was significantly decreased with fabric bag treatments. Removal or the fabric bag was done prior to transplanting and the integrity of the root ball could not be maintained for Acer and Quercus. Much of the improvement in root mass for these two species was negated because the root ball fell apart. Yadav et al. (13) also found that with live oaks it was difficult to remove the fabric bag without disturbing the roots. Removal of the fabric bag also damaged the white new initiated roots on the surface of intact root balls for all species. Survival of trees during the post harvest period and after transplanting was not affected by planting method. All trees survived this period. Trees from fabric bag treatments that remained intact during transport did exhibit fewer water stress symptoms and leaf drop; however, these observations were not quantified. The increased root mass may offer some advantages under more stressful conditions. The problem with the fabric bag may be in keeping the root system intact during transport. Trees in this experiment were handled with great care and were not stacked or handled as roughly as they would be in a typical nursery situations, yet many of the Acer and Quercus root balls were easily disturbed. B&B trees were placed in wire baskets and withstood more abuse than fabric bag grown trees. These observations could have more abuse than fabric bag grown trees. These observations could have implications on transport and stacking of fabric bag nursery stock. Disturbance of the root ball with removal of the bag can negate any advantages the fabric bag may offer and each species’ internal controls will have a big influence on the capacity for new root growth. B&B root systems were unrestricted and their roots were severed during the harvesting process. The ability to regenerate roots from severed ends can vary seasonally and is unique for each species. It is not known if severed unrestricted root systems and non-severed restricted root systems have similar seasonal patterns of root regeneration. 1.) Fare, C.D., C.H. Gilliam, and H.G. Ponder, 1985. Toot distribution of two field-grown Ilex. HortScience 20(6): 1129-1130. 2.) Gilman, E.F. 1988. Tree root spread in relation to branch drip line and harvestable root ball. HortScience 23(2): 351-353. 3.) Kelly, R.J. and B.C Moser. 1983. Root regeneration of Liriodendron tulipifera in response to auxin, stem pruning, and environmental conditions. J. Amer. Soc. Hort. Sci, 108: 1085-1090. 4.) Larson, M.M. 1984. Seasonal planting, root regeneration and water deficits of Austrian Pine and arborvitae. J. Environ. Hort. 5.) Lee, C.I. and W.P. Hacket. 1976. Root regeneration of transplanted Pistacia chinesis ‘Bunge’ seedlings at different growth stages. J. Amer. Soc. Hort. Sci 101: 236-240. 6.) Ritchie, G.A. and J.R. Dunlap. 1980. Root growth potential: its development and expression in forest tree seedlings. New Zealand J. For. Sci. 20:218-248. 7.) Stone, E.C. and G.H. Schubert, 1050. Root regeneration by ponderosa pine lifted at different times of the year. For. Sci. 5:322-332. 8.) Struve, D.K. and B.C. Moser. 1984. Root system and root regeneration characteristics of pin and scarlet oak. HortScience 19:123-125. 9.) Watson, G.W. 1985. Tree size affects root regeneration and top growth after transplanting. J. Aboric. 1:37-40. 10.) Watson, G.W, and E.B. Himelick. 1982. Root distribution of nursery trees and its relationship to transplanting success. J. Arboric. 8:225-229. 11.) Whitcomb, C.E. 1986. Fabric field-grow containers enhance root growth. Amer. Nurseryman. 163(7):49-52. 13.) Yadav, U.D. Ingram and b. Reese. 1987. Observations on transplanting from field-grow containers in Florida. Proc. Southern Nurs. Assoc. Res. Conf. 32:162-163.